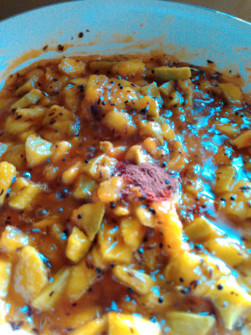 Here are step by step instruction for making Methamba, a Maharashtrian green mango relish recipe. It is a summer special recipe. Methamba is made in most homes in the beginning of summer. 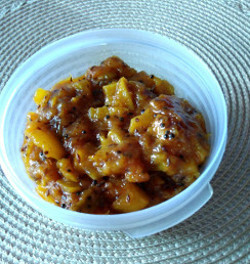 You could say Methamba is a mango curry or a salad or a side dish. 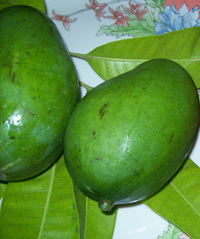 Raw green mangoes are available in the beginning of summer. Sour green mangoes are generally used to make methamba. 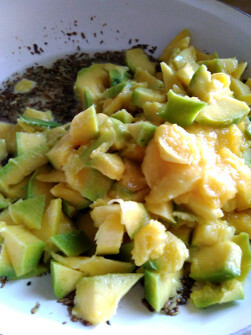 Raw green mango/ kairi - 2 cups, peeled and chopped. 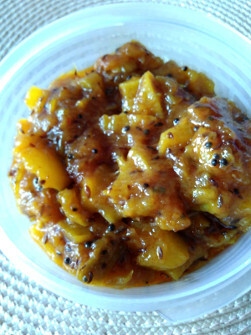 Grated/crushed jaggery / gud - 1/2 Cup, more or less according to taste and the sourness of mango. Red chili powder - 1 1/2 tsp, more or less according to taste. 1. Heat the oil in a pan/kadai. Keep heat medium. 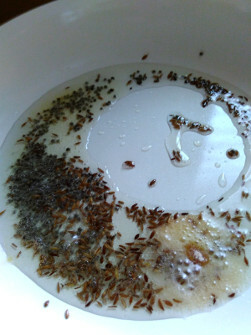 When oil is hot, add mustard/rai seeds, cumin/jeera and let them splutter. 3. If you are adding whole methi /fenugreek seeds, add them now and stir-fry till they start to change colour and you can smell the aroma of methi. Do not let methi seeds blacken. I am adding methi/fenugreek seed powder, so I will add that later. Add chopped raw green mango pieces. 4. Mix with oil for a minute. Mango pieces will soften a little. 5. Add chili powder, asafoetida/hing, and turmeric/haldi, grated jaggery, salt. Mix well. The combination of mango jaggery and salt will release some water. Continue cooking on medium flame for 2-3 minutes. 6. I add methi powder and haldi now. 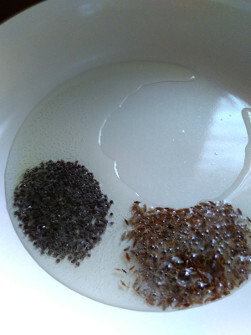 Depending on how thick or thin you want methamba, add some (1/2 to 1 cup) water. I added about 1/2 cup water. Methamba will thicken when it cools. Mix well. 7. 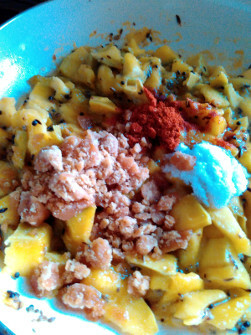 Cook till the mango pieces change color and are soft. The mango pieces will start to lose shape and will look slightly mashed up. That is ok.
Switch off stove and let cool. Methamba is ready. Serve as an accompaniment to rice, chapati, roti, dosa etc. Methamba will remain good at room temperature for 2 days. To store longer, refrigerate the Methamba. It will keep for 2 weeks in the fridge. Use sour variety of mango. That gives better taste though you have to add jaggery/sugar to balance the sourness of mango. You may use sugar instead of jaggery. For me, jaggery tastes better with mango. 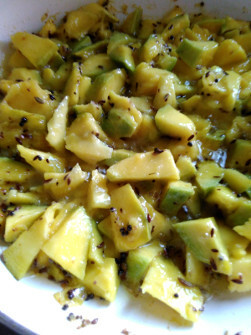 Methamba may be made with green or ripe mango. Ripe mangoes will need less jaggery and they are already sweet. 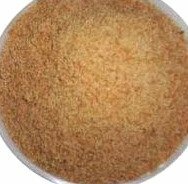 Methamba color will depend on the color of your chili powder and turmeric powder(haldi).